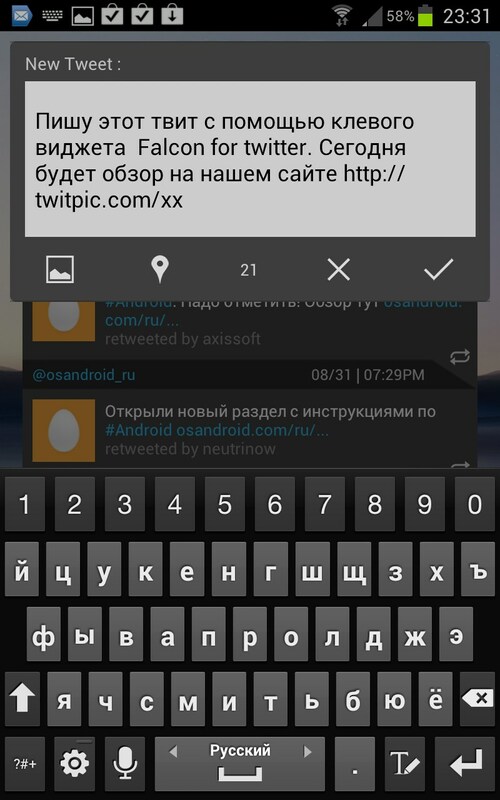 Falcon for Twitter – Soft for Android 2018 – Free download. 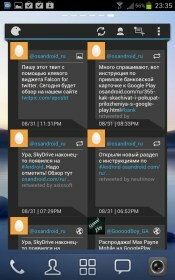 Falcon for Twitter – Multifunctional widget for Twitter. Falcon for Twitter - is not just another Twitter widget, and a real multi-client, which does not require special applications and add-ons. 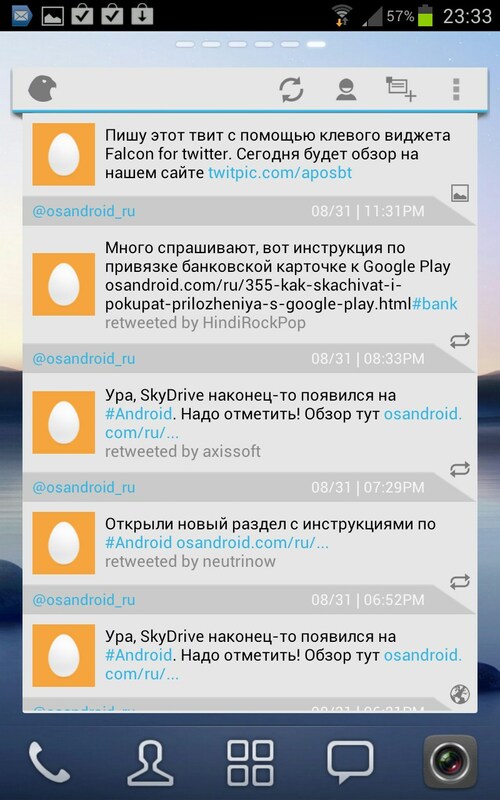 In fact, Falcon - a full-featured Twitter-client, sewn into the shell of Twitter, which allows him to always be running, and display relevant information in the tape. 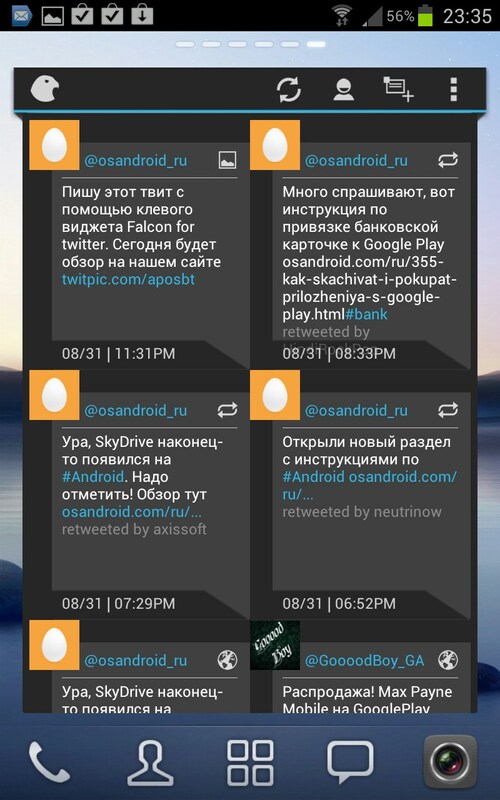 Falcon developers decided not to release another Twitter client, like Tweedle or Tweet Caster . 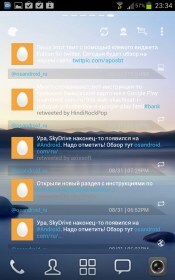 Instead, they went to the new road, and have developed a new concept of Twitter, a full-screen widget. This concept - is both the main advantage of the application, and its main disadvantage. Since the program is a widget, it is always on the screen and does not require downloading. All functions of the widget work instantly without any delay. With it you can watch his tape, view incoming messages and retweets, and, of course, to write tweets themselves. It is noteworthy that when you click on a tweet, it opens in a full window and stands before us in all its glory. If the record is attached to an image or a video, and upload it also will be displayed without the need to open the browser. 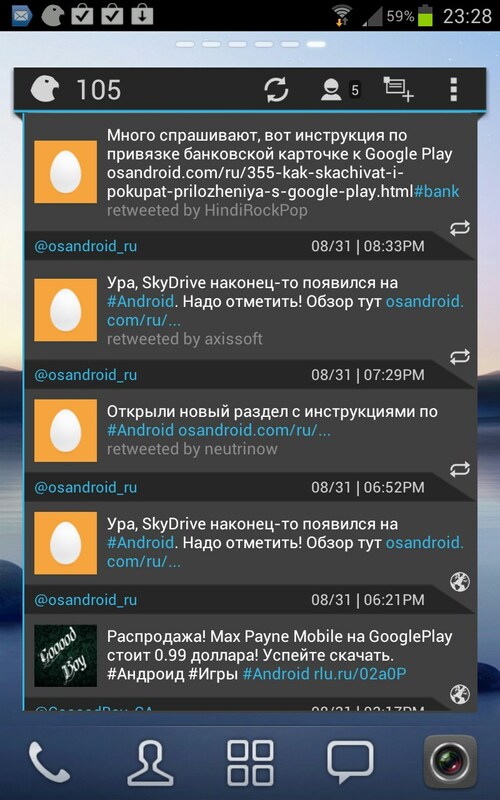 In addition, in the same window will appear for all the responses and retweets. Unfortunately, the program is not updated familiar sipping tape down and using the "refresh", which is in the top panel. This was done because of the restrictions imposed on the widgets in the operating system Android. Also, the top will indicate the number of unread tweets, next to the company logo "heads." 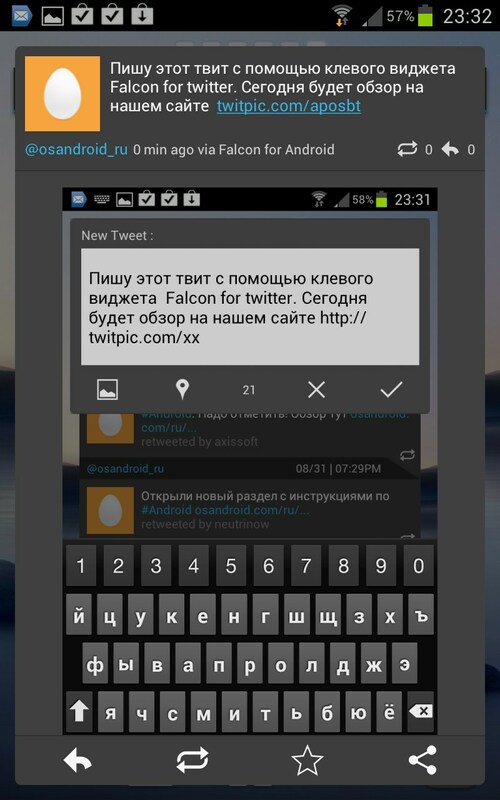 In the setting of Falcon for Twitter can change the interface and select one of the 6 pre-installed themes. In addition, you can decide to change the coloring of your choice by selecting from a palette of different colors. You can change the interface to display messages on the classic in two columns. The main drawback of Falcon, as reported above, is that it is a widget, and how the developers did not want it, the application will consume a lot of power in the precious battery. Here lies the main sticking point: either you always have enough battery life, and you shall afflict this or that widget for Twitter is not for you. Outcome. Falcon - a very high quality twitter widget that will give odds to many full client. The application is free, with one condition, that will sometimes slip promotional tweets that can be disabled, Donat-bought version.